The recent cooler weather conditions have had a positive affect on our Ft. Lauderdale fishing trips. That nasty weather up north recently has lowered our temperatures in the early morning to the low to mid 50s, and that has been good news. We continue to enjoy a good amount of sun on most days. Very fishable with reasonable wind conditions offshore.The latest frontal system passed through here very quickly, bringing some Sailfish action. South Miami enjoyed the best fishing due to current conditions but we did get in on some of the action. 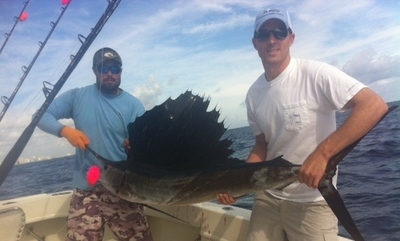 That is Ben and 1st mate Brian J. with a nice catch and release Sailfish in the photo. As we stated the erratic current conditions have made it a little difficult but with some searching there are more fish available now. With the wind we have had some Mahi Mahi as well. These Mahi remain close to the reefline with the abundance of Flying Fish seeming to be a factor for their choice of that area. Kings are available but not in any numbers. Occasional Blackfins and full grown Bonito. Bottom fishing remains decent. Wahoo despite the moon phase are few and far between. Enjoy this weather, we certainly are, and tight lines as well from the crew @ Marlin My Darlin.